NJ Leathernecks MC Just as the United States Marine Corps is a proud and distinct organization which stands apart from other military organizations, so too, the Leathernecks Motorcycle Club is a proud and distinct organization of active-duty and former Marines and FMF Corpsmen, which stands apart from, yet not against, other motorcycle clubs. Just as the United States Marine Corps supports God, Country and Marine Corps Brotherhood, so too, the Leathernecks Motorcycle Club supports God, Country and Marine Corps Brotherhood. 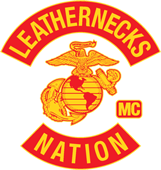 Just as the United States Marine Corps stands ready to defend our country and allies against tyranny, so too, the Leathernecks Motorcycle Club stands ready to defend itself against tyranny of any kind. Our enemies know, to their regret, our will, resolve and methods. The Leathernecks Motorcycle Club is not territorial and claims no territory. We have no need of reputation building. The Eagle/Globe/Anchor needs no introduction. We respect all men except the enemies of our country and free way of life. We are not interested in joining, or interfering with, the affairs of others. We desire only to ride our motorcycles in the company of our Brothers as Free Men in this Free Land; a land for which we and our Brothers have fought "In Every Clime and Place" during the past 230 years. Currently, and always, we have Brothers in hostile places around this globe defending your right to choose as you please. We will never seek to transgress anyone and we expect the same courtesy in return. The Leathernecks Motorcycle Club is not territorial and claims no territory. We have no need of reputation building. Your grateful donation will go towards the causes we support. Our members consist of a very special breed of person. In most military services, you can be all that you can be, but the members of this club who joined the Marines, found themselves being more than they ever thought possible. Copyright © 2019 NJLeatherNecksMC.com. All rights reserved.